How can one even begin to explain the complexity of saxophones? – It can take months before you fully grasp the fundamentals of playing and the mechanics that make the sound of this brass woodwind instrument one of the most distinctive in music. In case you didn’t already know, you can’t just use any random saxophone to play a wide range of musical styles. Check out my personal favorites and see what sparks your interest. 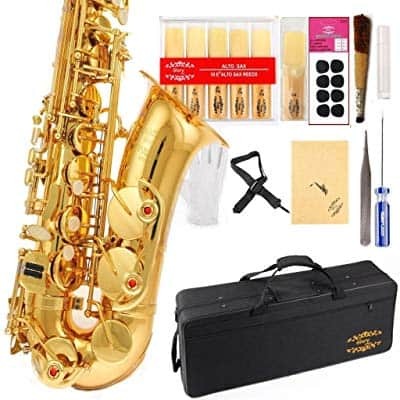 My list includes affordable, expensive, beginner-friendly, as well as complex saxophones in both alto and tenor registers. 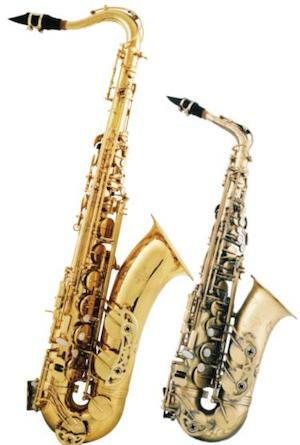 Alto or Tenor Sax – Which One Is for You? In What Way Does Price Matter? The MAS-30 saxophone’s gold lacquered finish looks very professional. However, Mendini didn’t make this alto saxophone just so you can look good while playing it. Each saxophone went through rigorous testing so that they could be delivered in excellent playing condition. At least that’s the sales pitch of this low-cost manufacturer. I was expecting a very generic and bright tonality but this alto sax has a surprisingly rich sound. I also enjoyed seeing a large bore. This makes it a perfect teaching instrument as students will have an easier time grasping the fundamentals. A very helpful tool is the tuner and metronome combo. The large LCD display makes it simple to monitor the beat and sustain. The tempo can be adjusted between 30 and 230 bpm which is very good for beginners, intermediate, and expert-level players. If you’re a street musician looking for a new sax, the MAS-30 might just offer you the most value for the money. Along with all playing accessories, you also get a nice carry case. It’s lightweight but very durable, which should help you carry the 10-pound sax wherever you go. I’ll be the first to admit that for a student saxophone the asking price is a bit high. 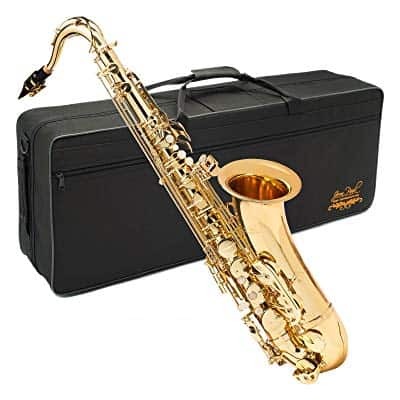 Still, the Jean Paul USA AS-400 is a very reliable alto sax that could be your companion from the first lesson till your 20th live performance. The sound quality is very impressive. The sax produces well-defined high notes with a surprising warmness for an alto sax. The note sustain is very good due to the airtightness of the mouthpiece and the sax design. The keys are arranged in a beginner-friendly manner that doesn’t force you to overreach with your bottom hand. All the accessories you need to play and perform maintenance are included in the package. The neck strap is surprisingly good because it’s adjustable. Even a carry case is included in the price of the AS-400, albeit a standard case. The overall value of the sax is great. The durability of the keys and bell brace is off the charts. The sound, the accessories, and the beginner-friendly setup make the AS-400 an impressive instrument. The only question that remains is how many beginners can afford it. If you can, you won’t be disappointed. The thick reed makes this alto sax sound remarkably warm. You can still hear the clear definition of the higher notes, but instead of a very bright tone, the sax sounds richer. Although this is not a high-end model, it shows amazing potential for street musicians. With some adjustments on the mouthpiece and proper tuning, the sax can do a great job in the recording studio too. 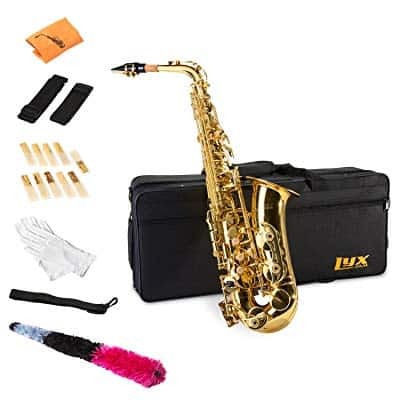 As it is with most saxophones, this one too comes with a complete set of accessories including gloves, neck strap, screwdriver, cleaning rod and cloth, etc. Even a hard-shell case is included which is quite good at this price point. Aesthetically-speaking, the sax looks OK but not spectacular. The lacquered gold finish doesn’t look very professional. At least the quality of the coating is good enough to last a few years. One issue worth mentioning is the lack of output. Although the mouthpiece that comes with the Glory gives you a rich sound, you will probably need another one if you want to play louder. A Legere reed should do the trick and also give you a more traditional alto saxophone sound. Of course, not all of you are picking up a sax for the first time. If you’re an experienced and accomplished musician, then upgrading to the Yamaha YAS-26 alto saxophone seems like the logical next step. The sax is costly. However, it comes with near unparalleled sound clarity and note sustain. Of course, the durability of the build is exemplary, as one might expect from a high-end Yamaha instrument. The sax is also very aesthetically pleasing. The combination of the yellow brass body and nickel-plated keys gives it a lot of depth as well as a professional look. The YAS-26 comes with a Yamaha 4C mouthpiece which is known for its ease of use and tonal clarity. Another feature that I felt improved the sound was the superior responsiveness of the low notes. This is due to the new approach Yamaha took in creating the low B-C# connection. As a result, you get more clarity, longer sustain, and tonal consistency across the board. Some might argue that the YAS-26 is a great starter instrument too. I see this model as a decent recording sax and live performance sax. 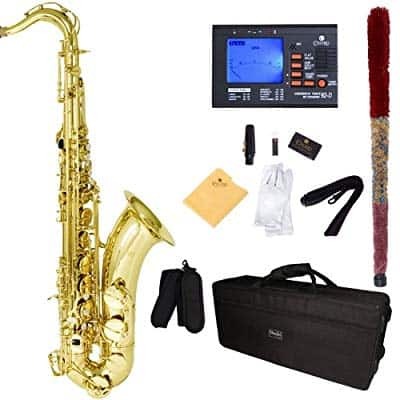 The price alone makes it hard to get for most entry-level sax players, even though Yamaha labels it as a student model – definitely stress this if your parents are paying for it. Are there better sounding student saxophones on the market? – Not if you’re looking for an alto sax. However, there are more affordable options that can still teach you the basics and allow you to practice for years before losing tonal consistency. Every now and then you run across an alto saxophone that’s stage-ready and yet has a very beginner-friendly setup that allows students to use it as well. Aesthetically, the LyxJam sax looks pretty standard. It is fully finished in gold lacquer without nickel or silver highlights. Unless you’ve read about it or actually played it, you can’t tell whether it’s a beginner or professional model just by looking at it. Of course, all the accessories are included just as it is with all other saxophones here. However, what makes this list of accessories unique is the set of 10 replacement bamboo reeds. They’re very durable and allow you to get good tonal consistency and note sustain due to the way they vibrate. The soft pads let you exercise more control over the tonality. This is something that can benefit both beginners and experts. That’s because even high-end saxophone pads can cause frustrations if not properly aligned or if they’re too hard and rugged. For an all-in-one set, the LyxJam offers a very good deal. The quality of the accessories may not be premium across the board, but it’s doubtful you will feel the need to buy a new mouthpiece or straps to improve your performance. 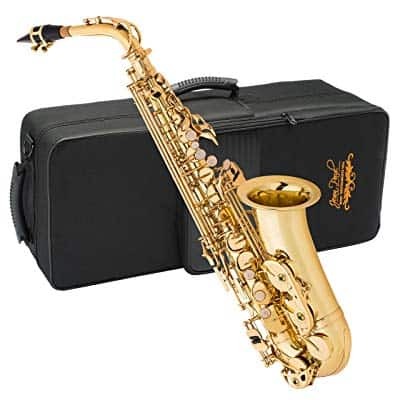 If you’re looking for something with a deeper sound, the Jean Paul TS-400 tenor sax should meet your requirements. It has a very warm tone and impressive sustain even though the mouthpiece is nothing special. The asking price might be a bit high unless you’re an experienced musician looking for a new everyday instrument. The bell brace is very strong, which improves the durability of the TS-400 tenor sax. The even key action is ideal for maintaining intonation consistency. As far as ease of play goes, the TS-400 is best suited for intermediate players. It may be labeled as a student instrument by the manufacturer, but the extra weight (17.5lbs) and size make it a challenging saxophone for inexperienced players. Although all the accessories needed for playing and maintenance are included, the quality of the carry case is nothing special. You may need something more rugged if you travel a lot. Surprisingly enough, the TS-400 sounds very similar to some of Yamaha’s more expensive tenor saxophones. I find this very important as it gives struggling artists a chance to get a professional-sounding tenor sax without breaking the bank. If you’re looking for a B-flat tenor saxophone that’s affordable enough for beginners yet still offers high-quality sound, Mendini is a manufacturer known for its low prices. 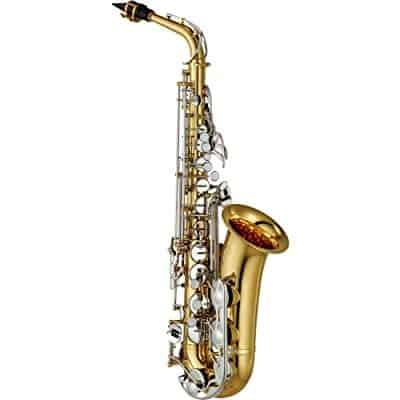 Just like the Mendini alto saxophone, this model has very good build quality. The durability is impressive and the bell brace, in particular, is a strong element. This should allow you to practice for hours each day without worrying about the longevity of the instrument. However, note that the standard mouthpiece makes this a loud instrument, so mind your neighbors. I rarely even look at a saxophone that doesn’t come with a wide range of accessories. You bet all basic supplies for maintenance and practicing are included here. However, there is one difference that puts the Mendini MTS tenor sax ahead of others in my book – the Cecilio 92-D chromatic metronome/tuner. This device alone makes up for a third of the MTS package’s value. It’s an advanced metronome that lets you practice at speeds of up to 230bpm, and it has great sensitivity when it comes to tuning. And, you will need it. Almost no saxophone arrives fully tuned, no matter what the retailer or manufacturer may try to tell you. Therefore, having this gadget makes this a lot easier and less frustrating, especially if this is your first sax. The YTS-62III is as expensive as they come. However, if you strive for excellence and want to be a successful tenor sax musician, you will be hard-pressed to find a better sounding instrument. This saxophone is fine-tuned to perfection. And it is based on a model that has stood the test of time. The YTS-62 series was launched in 1979 and was an instant success. Since then, Yamaha has continued to address minor issues and improve on the quality of the materials and craftsmanship. It’s no surprise that most band directors recommend it as a very reliable and durable instrument. You may not think of the price as steep if you travel the country year-round playing tenor sax. I also can’t argue with the warmth of the sound and the impeccable sustain and consistency that the sax offers, even when used with the standard Yamaha 4C mouthpiece. In terms of difficulty, the YTS-62III is clearly not for beginners or at least not young players. The sax is big and there’s a good amount of spacing between keys. You will need a solid foundation before you can start playing it and getting what you paid for in terms of sound and comfort. Alto saxophones are lighter and smaller than tenor saxophones. They’re also slightly easier to play, which is why they’re preferred by beginners. This doesn’t mean that they don’t have a professional sound. You will also notice that alto saxophones have a slightly different design with the neck coming up at the end. Tenor saxophones feature a neck that bends down. There’s also a distinctive sound to each instrument. 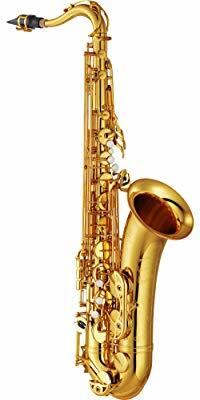 Because of its size, the alto sax sounds brighter and the high notes are more detailed. While the general impression is that the tenor sax has a deeper sound, I would argue that it’s even richer and more complete. The register is different for both instruments. A tenor saxophone is built half an octave lower than an alto sax. More specifically, an alto sax is an E-flat instrument and the tenor sax is B-flat. You have to keep this in mind as it will affect the way you read sheet music. In the hands of expert players, both instruments can be manipulated to create a wide range of sounds. 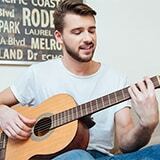 For professional musicians, the choice comes down to personal preference. But when it comes to beginners, an alto sax is a lot easier to start with, especially if you’re young or just have small hands. Believe it or not, these days there isn’t a lot of difference in performance between affordable and high-end saxophones. Part of this is because a saxophone maker can take the same design and materials and make the saxophones in a low-cost country. Although there will be differences in intonation, note sustain, consistency, and of course build quality, you don’t always have to pay a premium to get a good instrument. It comes down to how much you can afford to spend. Also worth keeping in mind is the fact that some saxophones don’t have good resale values. You won’t be playing with one sax for the rest of your life, so you might want to consider getting one that can be resold when you decide to upgrade. Besides the reputation of the brand and model, the resale value can be affected by the sound and also the build quality. But you can resell any saxophone if you set the price low enough. Almost all saxophones come with some accessories. At least the basic cleaning cloth and rod will be included. But you might not always be fortunate enough to get a good carry case or replacement reeds. There are many things that you’ll need for tuning, playing, and maintaining your saxophone. At least for a beginner instrument, I put a lot of value on the quality of the included accessories, and so should you. Keep in mind that some of the included standard mouthpieces won’t bring out the best in your new sax. Whenever you can get something of higher value as part of the package, it’s usually worth paying a small premium. As previously mentioned, a tenor sax has a rich sound. Therefore, if you’re interested in playing rock & roll, jazz, and more modern fusion, a tenor sax will generally blend better with the other instruments. If you’re interested in classical music then you might want to find an alto sax. The bright tonality is better suited for classical sheet music. But a tenor sax can also do a good job if you are to play in a saxophone quartet. The saxophone is a very complex woodwind instrument. 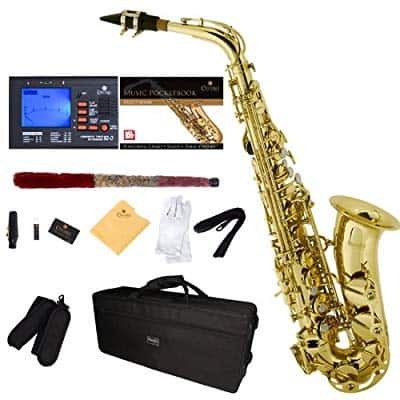 There is a frustrating amount of variety in prices, features, and setups that can make an aspiring sax player go mad trying to pick out an instrument. Don’t be afraid to spend some extra time looking at reviews and different manufacturers before making a purchase. This is a hard instrument to master and you will want to give yourself the best possible start if you want to succeed.